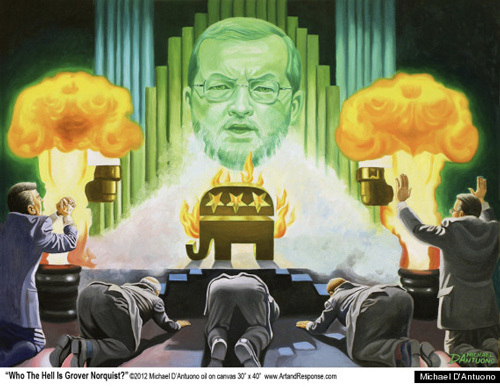 Political artist Michael D’Antuono‘s painting, entitled, “Who the Hell Is Grover Norquist?” gives a whole new look at the conservative lobbyist opposing congressional tax increases. The founder and president of Americans for Tax Reform looms Oz-like above well-dressed supplicants, breathing smoke onto a backwards Republican logo.”He is the lobbyist whose Svengali-like control over the GOP has forbidden them to end the Bush tax cuts for the rich, creating unpresedented gridlock and putting them in a very ‘uncompromising position’ negotiating the fiscal cliff,” D’Antuono asserts on his website. The only thing that could make this partisan painting better is a surprise appearance by Jon Keas’ Wicked Bachmann of the West. See more of D’Antuono’s politically-charged paintings below, and let us know your thoughts in the comments section. Did the artist go too far?